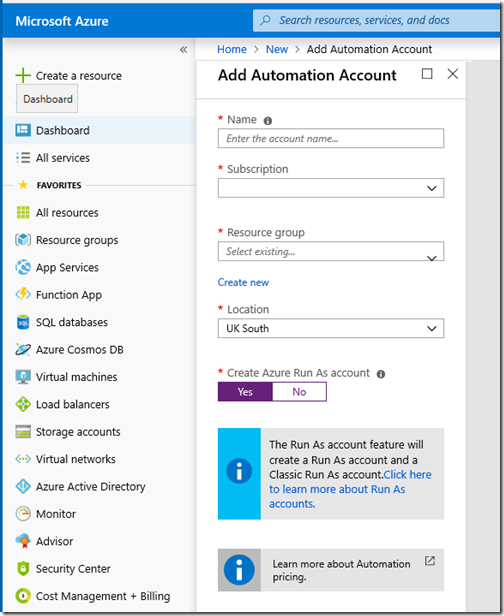 I have written recently about Windows Virtual Desktop, the ability to set up a virtual desktop environment on Azure at a relatively low cost, provided your users have Microsoft 365 accounts. My test setup is minimal but I have been watching the cost which is currently working out at £5.39 per day. This excludes the cost of Microsoft 365; it is purely for the infrastructure including VPN gateway, storage and VM. Bandwidth is a variable cost but almost negligible on my usage. Of that cost, the VM is around 75%. So if I could shut down the VM when not in use the savings are substantial. 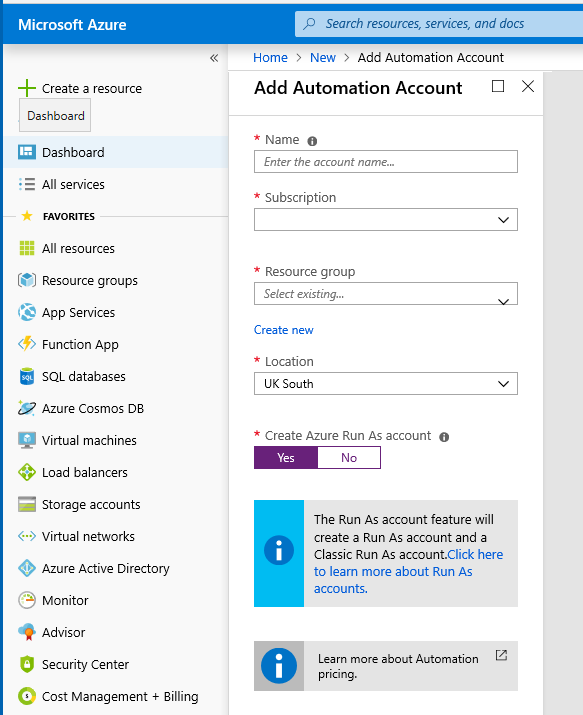 It turns out this is pretty easy on Azure though it requires some plumbing. 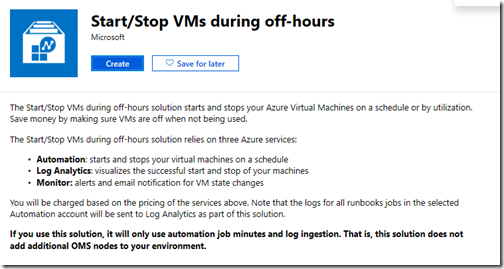 VMs do have a built-in option to shutdown on a schedule, but not to start up. To get start/stop, you need an Automation Account. 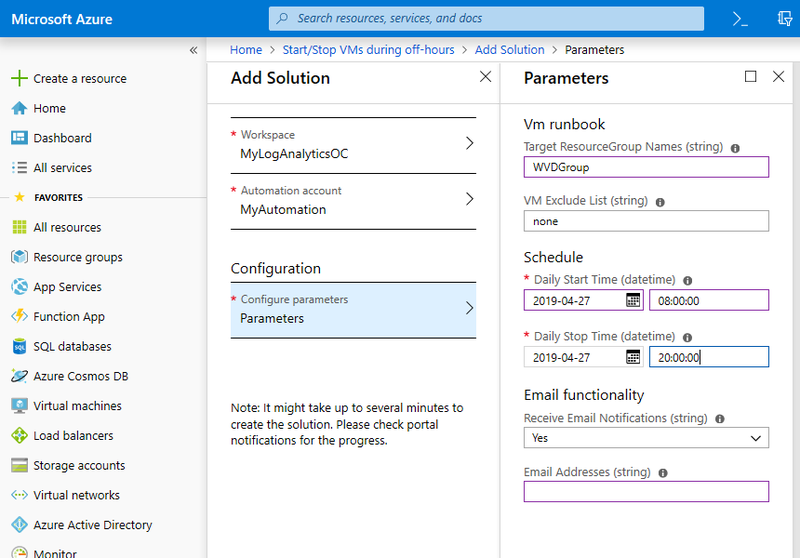 With the automation account created, select it, hit Start/Stop VM, then click “Learn more about and enable the solution”. You get this dialog. Here we learn that to save money, we have to spend it, on three new services: Automation, Log Analytics, and Monitor. It is not too bad though as there is a free tier for these services that may be all I need. Hit Create. In this window you have to configure three sections. Nothing challenging, but note that in Configuration you set the Target Resource Group Names. No pick list here, you have to type in the names. Or use a wildcard, which is unlikely to be a good idea since by default it will start and stop ALL your VMs. The schedule is not very smart, just a daily on and off, but see below. Once done, click Create to add the solution. All done, but what about weekends, for example. This is easily fixed if you create your own schedules. Just go into your automation account and click Schedules under Shared Resources. The wizard-created schedules are listed, and you can modify them or create new ones. It looks as if you might need 5 schedules, one per weekday, recur every week, to make your VMs not run at weekends. There is no Monday-Friday option. More documentation here. 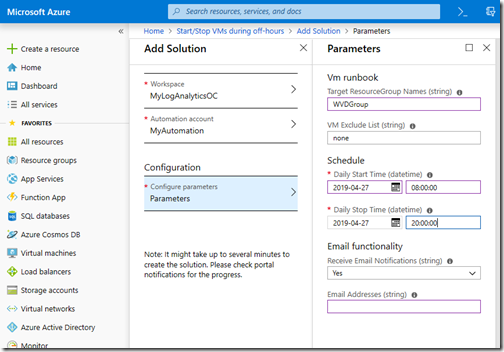 Note that automation can also run PowerShell scripts which will be even more flexible. Scheduling cloud resources to shut down when not in use must be one of the most effective ways to reduce IT spend. Microsoft has announced its quarterly financial statements, reporting revenue of $30.6 billion, up 14% on the same period last year. The story seems to be largely more of the same, which is good for the company in that all its numbers look good. 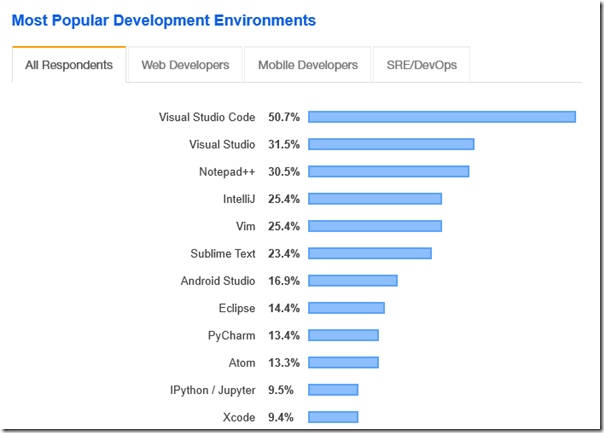 The most striking figure is 73% increase in Azure revenue. Azure is the smallest of its three self-defined segments though, though all three are similar in size. “More Personal Computing” (Windows, Surface and gaming) delivered the most revenue, followed by Productivity and Business Processes. That said, at this rate of growth Azure will soon be the biggest of the three segments. Aside: has there ever been a dafter segment name than More Personal Computing? More than what? Some points to note. Microsoft reported a “material improvement” in Azure gross margin, something which does not surprise me. 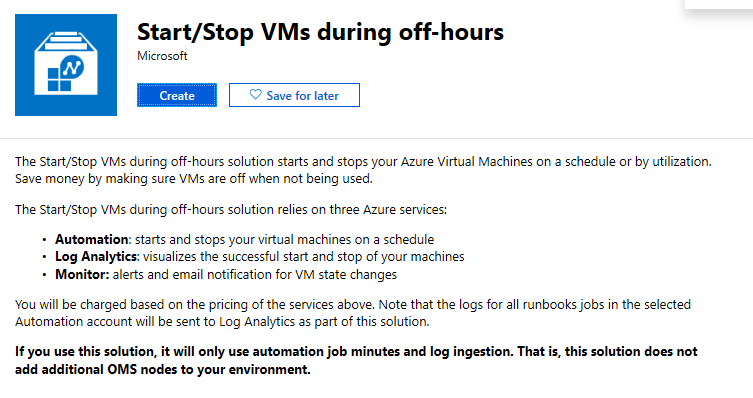 In my experience, the Azure Portal does a great job (from Microsoft’s perspective) in steering you towards premium services and extras, as I found when trying Windows Virtual Desktop – check my note on the VPN Gateway at $140 per month). Office 365 is still growing, up 30% according to Microsoft’s slides. LinkedIn is also increasing revenue, up 27%. Despite Chromebooks and mobile, Windows is still a cash cow with revenue from Windows OEM Pro up 15% year on year. Consumer revenue is down 1%. In the earnings call CEO Satya Nadella called out Teams as “bringing together everything a team needs” (well, apart from a proper shared calendar). We will invest aggressively in strategic areas like Cloud through AI and Github, Business Applications through Power Platform and LinkedIn, Microsoft 365 through Teams, Security, and Surface as well as Gaming. The Power Platform is today comprised of three services – Power BI, PowerApps and Flow … It is a system that enables users to do three key actions on data that help them drive business: Analyze, Act, and Automate. We do this with Power BI, PowerApps, and Flow, all working together atop your data to help EVERYONE, from the CEO to the front-line workers, drive the business with data. It is a common scenario for any team: you have projects which break down into various tasks, and you need to assign tasks to team members with deadlines. The low-tech solution is that you have a meeting, you assign the tasks, and each person organises their time in whatever way works for them. 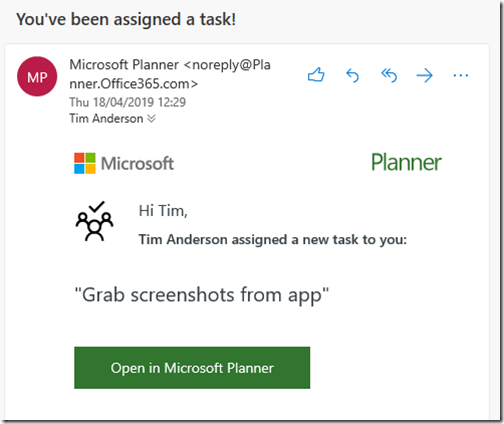 A calendar entry with a reminder, perhaps, or a task entry with a reminder, if you use Outlook and Exchange or Office 365. But what if you want a project-level view of how the tasks are going? Again there are low-tech solutions like Excel spreadsheets or even a whiteboard on the wall. 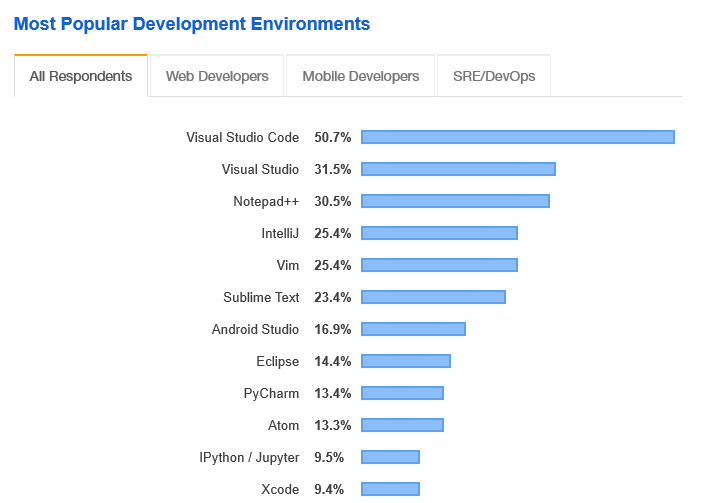 Of course there are software solutions as well. 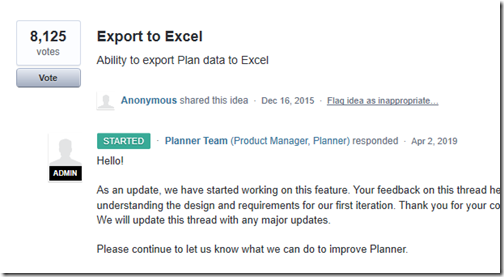 On Microsoft’s platform (which is the subject of this post) you could use Microsoft Project. A user license for Project Online Professional is currently £22.60 per month, though, more than double the cost of an Office 365 Business Premium account (£9.40). Even a team member license (Project Online Essentials) is £5.30. It seems a big leap in cost, and is more than many businesses need in terms of features. There is an alternative, which is Microsoft Planner. 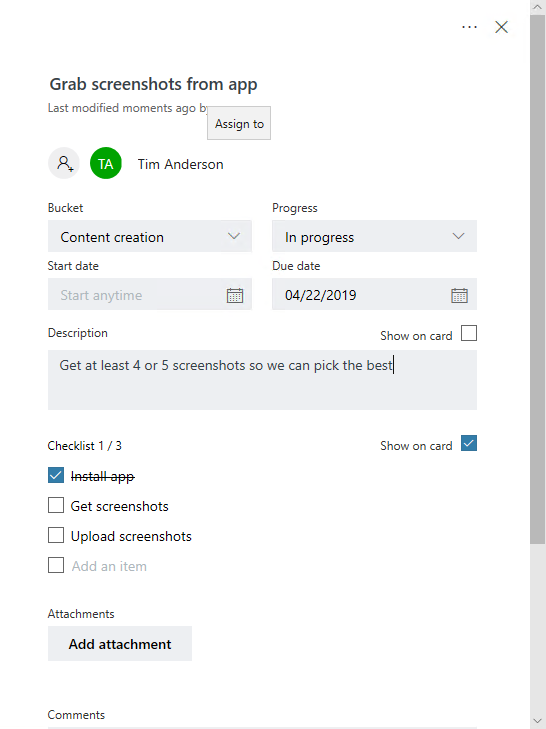 This is one of those Office 365 apps that is not all that well known, and it comes for free with most Office 365 plans. 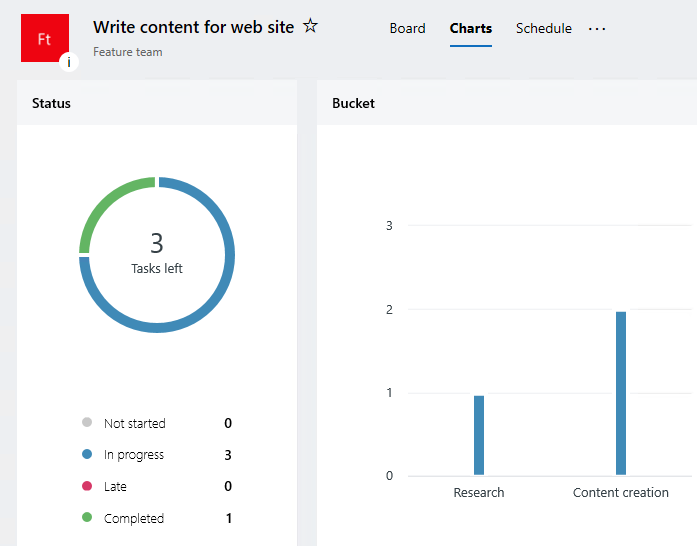 It gives you basic project management, with the ability to assign tasks to team members. 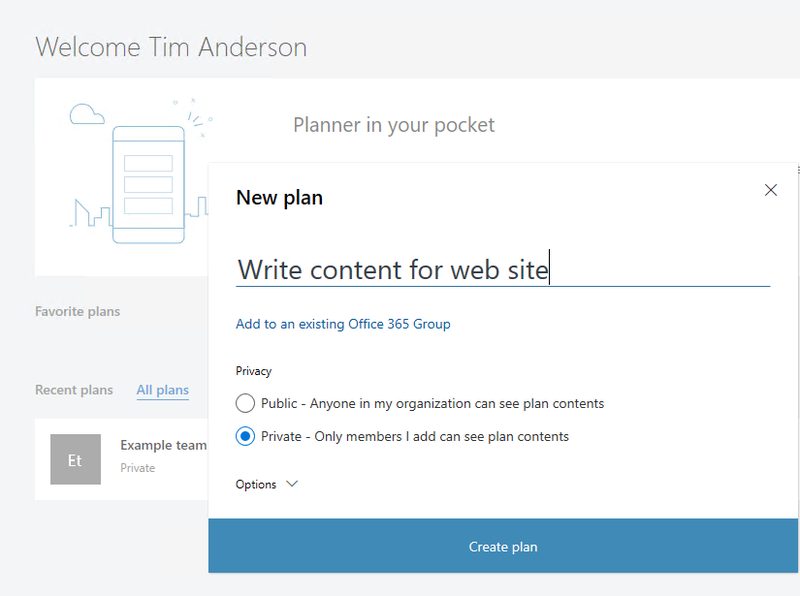 You can find Planner by logging into Office 365 and choosing Planner from the All Apps view. Once Planner opens you can create a plan. I advise a careful look at this dialog before clicking Create plan. If you have one big project, such as perhaps a new product you are developing, a plan dedicated to that project makes sense. If you have multiple small projects though, it would be better to have a single plan to contain multiple projects. The reason is that plans have a relatively high overhead. 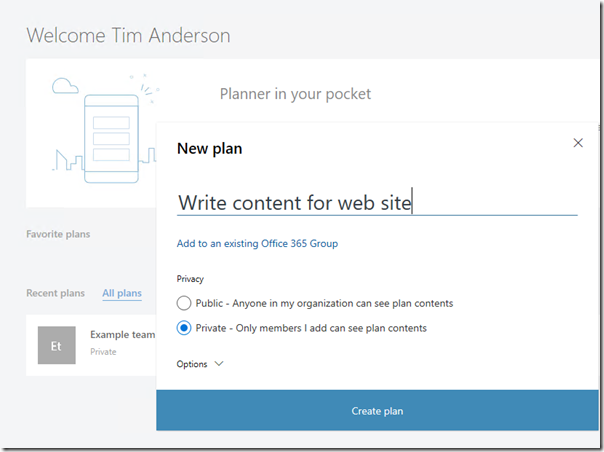 Each plan by default creates an Office 365 group and an Office 365 Sharepoint site. This could easily become a maintenance nightmare. Within a plan though, you can have multiple buckets, and each bucket can contain multiple tasks. 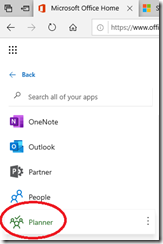 Note also that you can use an existing Office 365 group. It might make sense to create the group first, if only to get a sensible name. By default, the group gets the game of the plan. 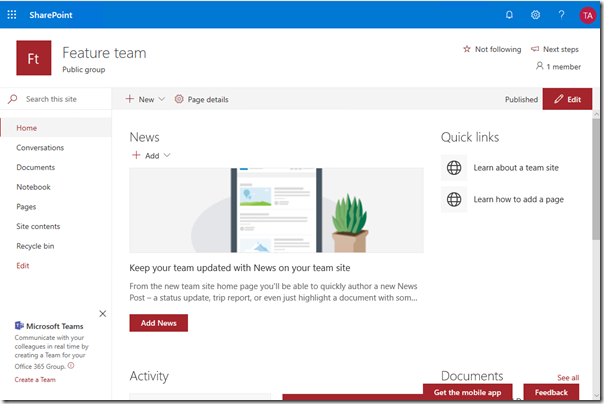 Only one Sharepoint site is created per group, so this is more lightweight (phew!). After thinking this through you hit Create plan. The plan is created and you can get on with adding tasks, the base unit of a plan. Tasks can be grouped into buckets (a good idea). Once you have a few tasks you can view charts showing progress and a schedule showing when task completion is due. When members are assigned a task, they get an email notification. 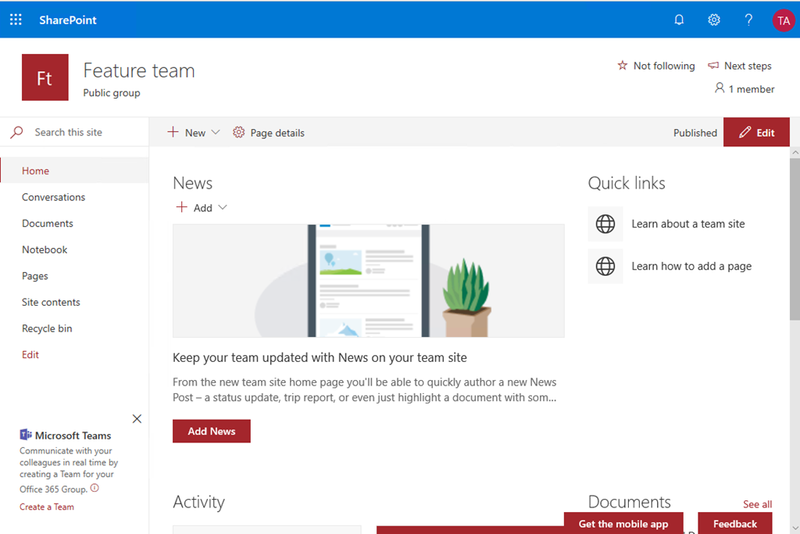 And as I mentioned there is Sharepoint site which can have all sorts of junk added to it. Now a few observations. 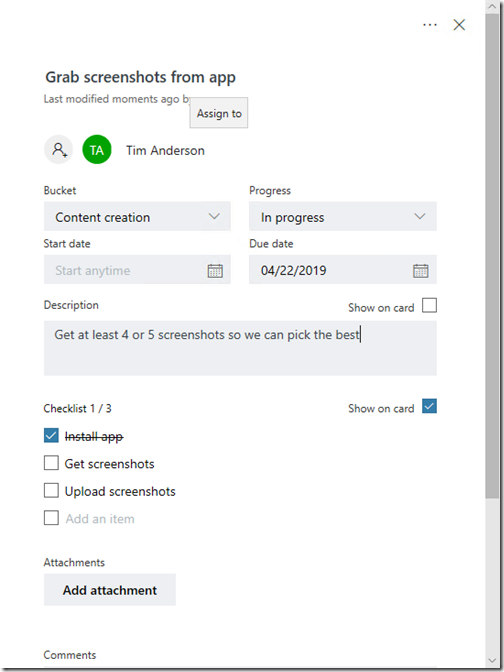 Planner looks useful but as so often with these Microsoft apps, there are things that make you want to bang your head against the nearest wall. 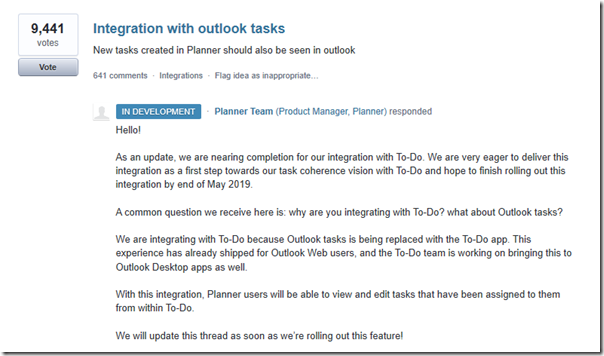 The most obvious problem is that Planner tasks do not integrate with Outlook tasks. The best you can do is to export the plan schedule to an Outlook calendar. Guess what is the top user request for Planner? 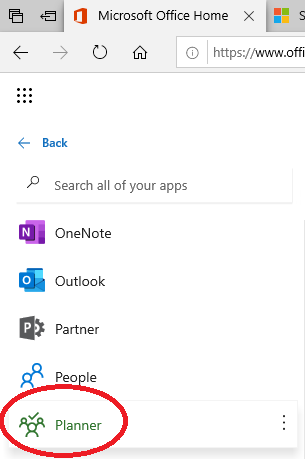 From here we learn of an added complication, that Outlook tasks are being replaced by Microsoft To-Do. Inevitable perhaps but I like Outlook tasks and the fact that everything is in an Exchange mailbox, and therefore easy to manage. Still, the good news is that it says In Development. Other limitations? Well, Planner is very basic. You cannot even have dependent tasks. You cannot set status to show the degree to which a task is complete, which even Outlook tasks can do. No Gantt charts either. Or features like milestones, cost tracking, risk assessment, time management, templates, prioritisation, projections, or other such features. In fact, you cannot even export to Excel, the second most requested feature (the team is working on this too). 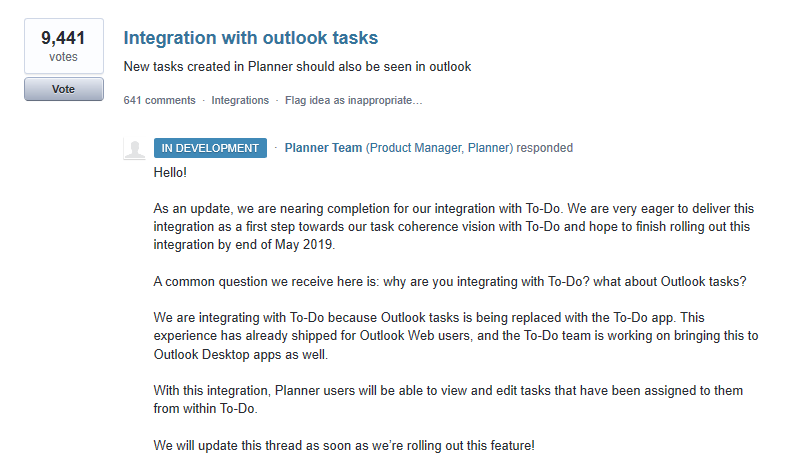 You cannot help but wonder if Microsoft does not want to make Planner too good, lest it cut into lucrative Project sales. If so, this is to my mind wrongheaded. For every Project sale lost, there would be three sales won for Office 365 if it came with an excellent project management tool built in. There is also the problem of duplicated effort. 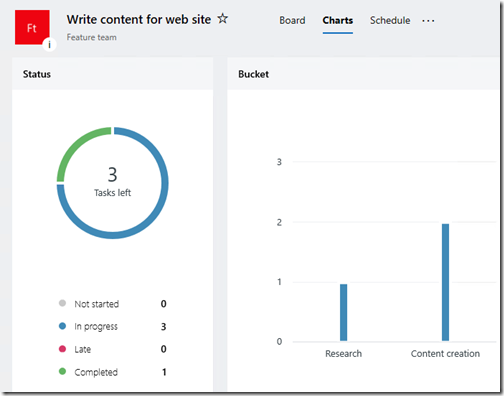 Why not get the Project team to develop Project Lite for Office 365, limited by lack of some of the more advanced features, but with a smooth upgrade path, rather than making an alternative product which is still not fully ready? Still, Planner is free with Office 365, and worth being aware of if you can get it to do what you need.